Fire Hooks Pulaski Axe is combination axe and grub hole. It is an ideal tool for chopping, and digging fire lines in hard and soft soils. Our axe head is attached to our fiberglass handle, which dramatically outlasts wood in firefighting applications, by resisting breakage, heat, moisture, and cleaning materials. It is preferred by many trail crews for loosening dirt, cutting through roots, or grubbing brush because it is widely available and easier to carry than single-purpose tools. Unlike grub hoes or mattocks the Pulaski is a sharp-edged took, and should not be used in rocky soil. 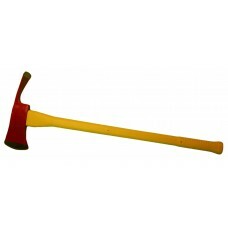 Pulaski combines an axe bit with an adz-shaped grub hoe. Ground and tempered cutting edges.